I asked to take a look at Princess Blend when I was at Murchie’s because of the name. I was very intrigued because it sounded like a great name for a tea that would be well suited for tea parties. While I was there, I was told that the blend was created in honour of the birth of Princess Charlotte which made me doubly interested in trying it out. The lowest amount that I could buy, as it isn’t a “top shelf” tea, is 2oz but the price wasn’t outrageous and curiosity got the better of me. Princess Blend is very pretty – it has a great floral aroma to it that mingles with fruity undertones that reminds me a lot of a mixed berry smell. Princess Blend has a great list of ingredients: Ceylon, Keemun, Darjeeling, and Himalyan teas, rose petals, pink cornflower petals, white cornflower petals, raspberry leaf, natural & artificial flavourings. Murchie’s webpage for Princess Blend also mentions bergamot in the description, but I don’t really smell it. 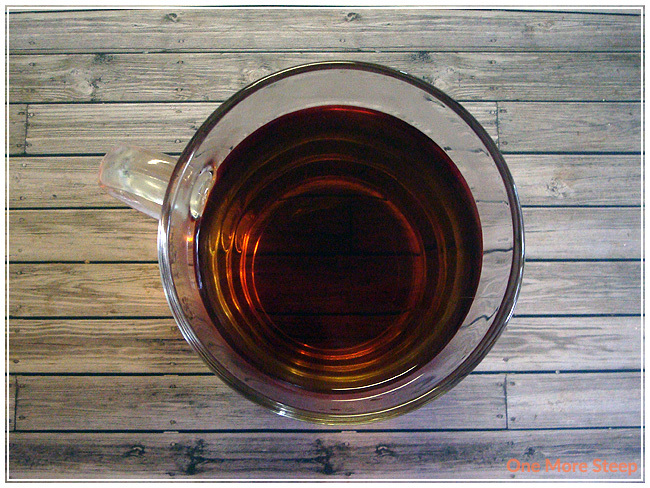 As a black tea blend, Murchie’s recommends steeping in 96-100°C (205-212°F) water for 3-5 minutes. Princess Blend steeps to a really nice amber colour. 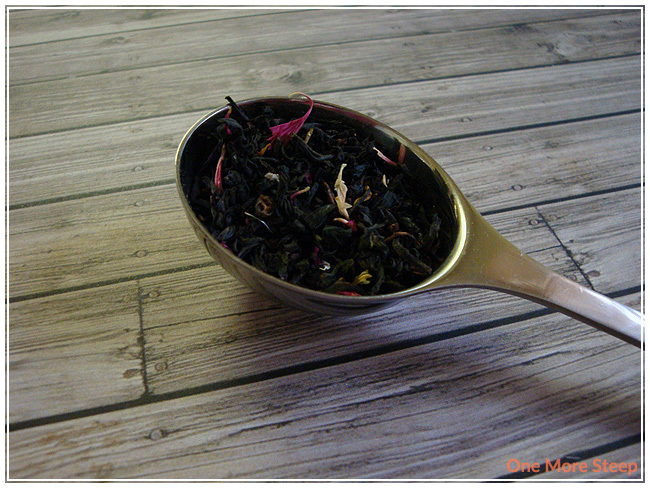 The tea smells quite fruity and floral, that raspberry leaf definitely does the trick! When having a first sip of the tea, I’m a little taken back by the astringency. It just makes my mouth pucker when drinking this tea. The black tea blend taste almost overwhelms the fruity and floral ingredients to the tea, which is a bit of a shame since that’s what I smelled before, during, and after steeping the tea. I added a bit of white sugar to my cup of tea and found that it really helped to bring out the floral and fruity taste of the tea. Not that the sugar tempers the astringency of the tea, but the tea is far more enjoyable when the taste matches the fragrance. I found that Princess Blend did really well for the second steeping. It was beginning to wane in flavour by the third cup, so if you’re not interested in a sub par cup of tea (and who is interested in bad tea?!) I would stick to steeping it twice. The third cup just isn’t that great and was more a hint of what Princess Blend could taste like. I did use sugar in my second cup as well. 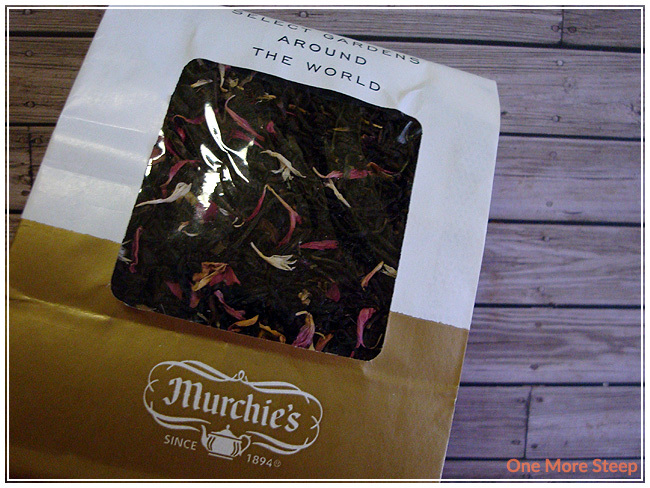 I liked Murchie’s Princess Blend. It’s a very tasty tea with a beautiful fragrance, and I love the name! I think it’d a great tea to have when having a tea party because it’s delicious and would probably pair well with sweet desserts or with a berry preserve. It’s not overly expensive, so it makes for a nice treat to have in the tea stash. I think it’s better that the bergamot does not stand out in the fragrance because the tea has such a beautiful floral and fruity taste to it that the bergamot would just add something to the tea that wouldn’t taste that great. My recommendation is to add sugar to really help bring out the raspberry flavours in Princess Blend.